Saint Anthony of Egypt, religious hermit, considered the founder and father of organized Christian monasticism. What, according to our Egyptian Coptic Orthodox Church, is Monasticism, as it was founded and blossomed in the early centuries? Yes, what is the Monasticism that attracted many tourists to Egypt just to see our fathers in the desert and hear a word of wisdom from their mouths; or learn some lessons from their fathers’ lives? Monasticism is not only a name or a monastery legacy. It does not reside in the monks’ clothes nor is it attached to their kolonsowa (head garment) or their belts. Monasticism is living a life of inner liberation from materialism. Our fathers have lived angelic lives. It is said that the monks are earthly angels and heavenly humans. They are people who have deprived themselves of every thing, to live humbly, and in contemplation in its highest level, executing the word of the Holy Bible.”Do not love the world or the things in the world” (1 John 2:15-17). “When He had made a whip of cords, He drove them all out of the temple, with the sheep and the oxen, and poured out the changers’ money and overturned the tables. And He said to those who sold doves, “Take these things away! Do not make My Father’s house a house of merchandise!” Then His disciples remembered that it was written, “Zeal for Your house has eaten Me up.” (John 2:15,17) Accordingly, monks rid themselves of all the worldly desires such as money, material things, positions, or fame. They leave everything so that God may be their world. 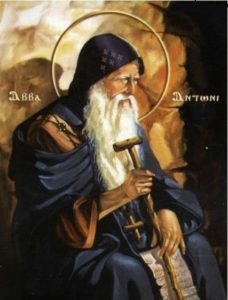 Monks no longer desire worldly ways or their positions, but they choose poverty exactly like their hero, St. Anthony fulfilled the word of the Bible “If you want to be perfect, go, sell what you have and give to the poor, and you will have a treasure in heaven; and come follow Me (Matthew 19:21). So, he went and gave away all of his possessions to the needy before he began his monastic life, and he lived as a poor monk in the ascetic life. How deep is the everlasting expression which identifies monasticism! Monasticism is a total withdrawal from every person and every material thing to connect to the One and Only “God”, who fills the heart, mind, and time. A monk will never achieve this spiritual level if he still desires worldly things. Here we remember what Jesus Christ said to Martha, “Martha, Martha, you are worried and troubled about many things. But one thing is needed and Mary has chosen that good part which will not be taken away from her.” (Luke 10:41-42). The goal of true monasticism is a continuous life filled with prayers. A life of continuous prayer is the main feature of a monk’s life, which ordinary people cannot live because of their worldly engaging tasks and interests. This is why monasticism is a life of loneliness. From loneliness originated the name of the monk. The word in Greek (monakes) means lonely. In French, “moine” means a monk. In English…etc. In loneliness a monk may continue a life of prayer, contemplation, and songs without delay or distraction of any kind.